So you’re looking for a new folding mobility scooter – but it has to be portable for the car or perhaps travelling overseas. At Active Scooters, we understand that buying portable mobility scooters can be a challenge. You want all of the quality and ease of use, but without the bulk. Thankfully, our scooter users love our portable mobility scooters – check them out yourself and see with a free week test drive! Our A30 is precisely what many of our clients have in mind when they look for portable mobility scooters for sale. The perfect blend of style, versatility and a small size make this compact scooter a must-have for anyone with mobility challenges that’s looking for a scooter they can transport, pack and unpack with ease. With its puncture-proof 9” tyres, you’ll enjoy easy travel, and it fits nice and neat in your car’s boot without a lot of hassle. Easy to dismantle and fold, yet solid enough to take with you virtually anywhere – try it yourself with a free in-home 7 day test drive! We’ll teach you how to unpack, assemble and pack together your portable mobility scooter fast and easy! The Genie+ Fold and Go with the click of a button. Do you want something even more compact than the A30? We’ve taken portable mobility scooters to a whole new level with the Genie+. Although it doesn’t grant wishes, it does deliver the next best thing of a superior, comfortable ride along with solid durability and reliability when traveling. It effortlessly folds up like a folding chair and fits easily right in the boot so you can travel with ease. When collapsed, it’s the size of aircraft hand luggage on wheels. Need to rest? Just unpack it and use the accompanying remote to let it unfold on its own. No heavy lifting or assembly required! Solid, puncture-proof tyres let you take it with you on uneven surfaces too – a must have for anyone who loves the shops and travel. We also help if you need to transport your scooter – our carriers ensure your scooter will remain mobile easily. It’s great for manoeuvring around crowded shopping malls and plazas, and its lightweight frame and battery is easy to carry. Want to know more? 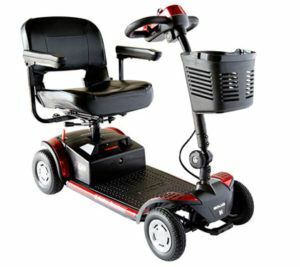 Give us a call or ask about our in-home trial for any of our portable mobility scooters. We’re sure once you feel the ultra-comfortable seating, the solid frame and the ease of use of these compact yet versatile scooters, you’ll look forward to your next outing with excitement! 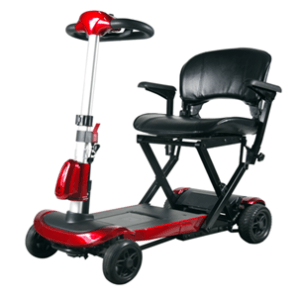 And don’t forget, our scooters are trusted by top organisations and healthcare providers including Occupational Therapy Australia, Red Cross, Baptist Care, Blue Care and more – giving you peace of mind that the portable mobility scooters we sell are top of the line, affordable and quality made.